"What would happen if a MacBook and an iPad hooked up? ", Steve Jobs asked his "Back to the Mac" audience today, and answered his own question with the release of two new versions of the MacBook Air, available today starting at $999. The new duo includes a 13.3-inch, 2.9-pound version, the same display size as the MacBook Air has had since it was introduced in January 2008. 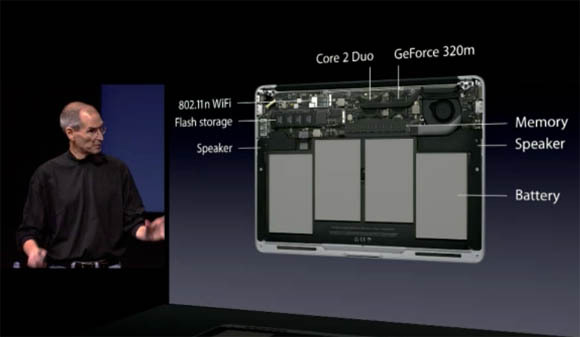 But the 13.3-inch model "has a younger brother, too," Jobs told his audience at the company's Cupertino campus. That li'l bro is a new 11.6 inch, 2.3-pound MacBook Air, with a display resolution of 1,336-by-768 pixels; its 13.3-inch big brother's resolution is 1,440-by-900 pixels. Both displays are driven by an Nvidia GeForce 320M graphics processor. Both models are also are powered by last-generation Intel Core 2 Duo processors - the 13.3-inch model at 1.86GHz, and the 11.6-inch model at 1.4GHz. The current top-end MacBook Air, by comparison, can optioned up to 2.13GHz. With a 64GB flash drive, the 11.6-inch model can be had for $999. Bump that up to 128GB, and you're talking $1,199. The 13.3-inch model runs $1,299 for 128GB of flash storage, and $1,599 for 256GB. "We know a lot about flash," Jobs said — meaning, of course, memory, and not Adobe's iOS-banned offering — saying that Apple is the largest user of flash memory in the world. Both models are thin, indeed: 0.68 inches, tapering down to 0.11 inches at the keyboard's edge. Jobs touted the two new devices' fast start-up time and improved battery life, both aided by the fact that the duo have solid state storage built onto their logic boards. The device's compactness is aided by the fact that the flash drives are right on the logic board, à la the iPad and other iOS devices, and that — like the earlier MacBook Airs — they have no optical drive. And, of course, no hard drive.